When people complain that Telugu film directors lack creativity and too many movies are remakes, I’d like them to consider Stalin. 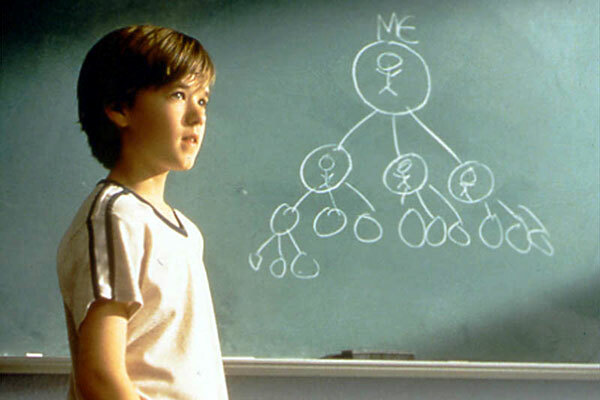 It takes a certain amount of vision to translate a film like Pay It Forward into mass Telugu style, and to cast Chiranjeevi in a role originally played by Haley Joel Osment. Nice one AR Murugadoss! Stalin (named by his Communist dad) is an ex-Army major, living with his Ma (Sharada) and passing time by doing good deeds and protecting the defenceless. It’s a typical altruistic hero role, with Stalin using his strength to look after the people. After a string of events that undermine his faith in humanity, he devises a scheme. Instead of accepting thanks he will ask anyone he helps to help another three people and tell them to pay it forward. In this way, the whole country will be incited to activism. It doesn’t seem to take off and Stalin is bitterly disappointed that people simply don’t do anything but make excuses. However, in the background the movement slowly gains momentum. That is all the good message-y stuff but I said this was mass. Stalin also battles a corrupt politician (Pradeep Rawat) and his crazy father-in-law (Prakash Raj) and their assorted lackeys. He is pursued by Chitra (Trisha) and nagged about marriage by his mother while trying to patch up the relationship between his Ma and estranged sister Jhansi (Khushboo) who married a Punjabi dude against said mother’s wishes. Add in assassinations, explosions, amputations and ‘only in films’ medicine. Phew! The message is heavy handed yet I can’t argue with most of the sentiments. The catalyst for Stalin’s formal implementation of good deeds is the suicide of a young girl who had lost both arms in an accident. Due to a series of mishaps she had no one to write an exam for her, something Stalin would have done but he was helping a blind student at a chemistry prac. She asked so many people for help and none would, so in despair she jumped off the roof. It was a bit out of character for a girl who fought so hard to get her education, but it made a point. People are often not deliberately bad, just lazy and thoughtless. Initially despondent, Stalin is inspired by a group of disabled kids who stop a race to allow a boy to get back up and then all finish together. Stalin ponders why people who have so much give so little. I don’t subscribe to the idea of the ‘inspirationally disadvantaged’ as I think people are people and having a physical disability doesn’t necessarily make for a particular personality type or behaviour, nor is it guaranteed to turn everyone around that person into saints. But I couldn’t help responding to the big delighted smiles of the little boys and the performances by the two college girls. I think English language mainstream films tend to either glamourize or overlook people who are different and I liked seeing real people, not actresses pretending to be blind and so on. One thing that irritates me is the filmi convention that insists ordinary people need a hero to lead them on all points. 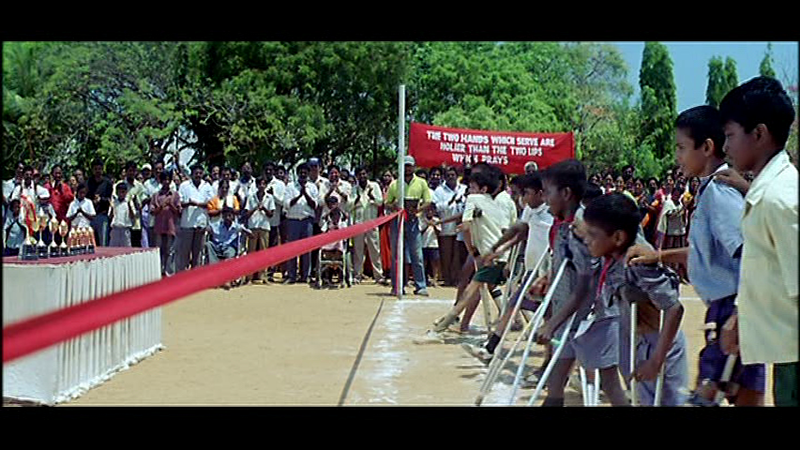 Stalin is offered a chance to go back into the Army only to have Gopi (Sunil) insist that ‘the people’ need him to inspire them to do good deeds. Why demand someone else be your role model when you already know what you should do? That laziness in films that sees entire rural communities under the thumb of a handful of drunk and not very bright rowdies, and entire neighbourhoods stand by and watch someone be maltreated is so frustrating, especially when its only purpose is to make the hero a HERO. And even more so in a film about people power. It’s an uncomfortable blend at times but Chiranjeevi’s apparent sincerity in the cheesy scenes and unswerving self-belief in the big chest-beating moments holds it all together. 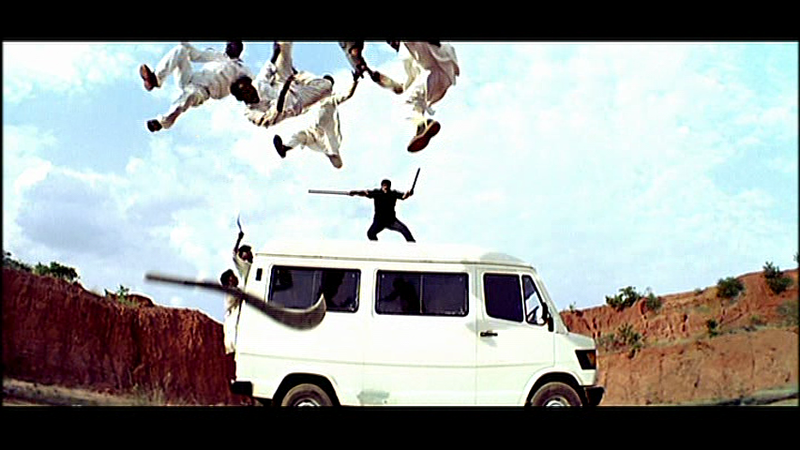 The fight scenes rely mostly on editing and effects as Stalin allows his enemies to come to him for a beating so suit the slightly more mature Megastar. For a do-gooder he uses threats liberally. But he did once singlehandedly overcome an enemy army emplacement so it would pay to listen. 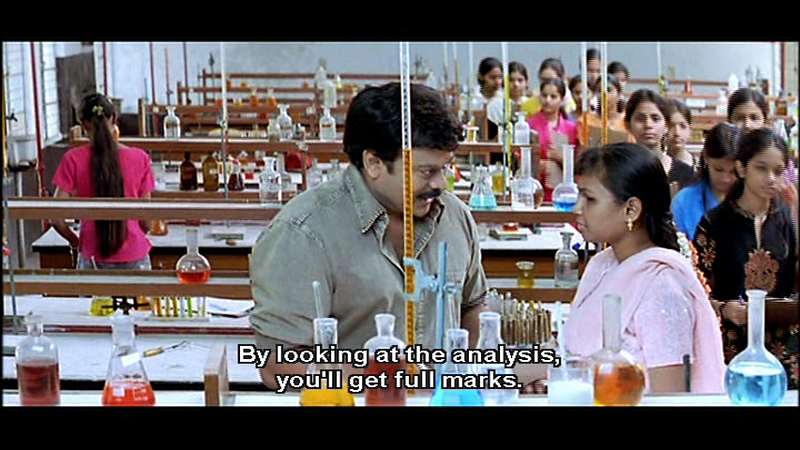 I was initially a bit uncomfortable with Chiru and Trisha as a couple. Stalin’s backstory makes it clear he is a fair bit older than her. The songs are mostly Chitra’s fantasy point of view so it worked better than expected as the cavorting was not his idea. 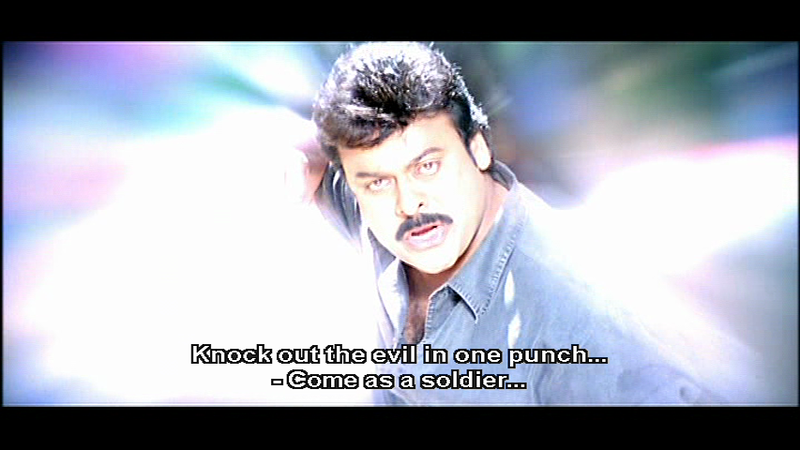 Anyway, it’s Chiru! Mani Sharma’s songs are fun and so are the picturisations, especially the traditional hero arrival number which also incorporates a call to donate organs, blood and eyes for the betterment of society. And apart from anything else the songs give the costume department an outlet for their experimental urges. Trisha is adequate but Chitra could have been played by almost anyone. Perhaps it would have been better to cast someone who could swim as Chitra was allegedly a swimming champion. I think she won a trophy for most ridiculous dive off the blocks and 10 metre dogpaddle with gratuitous appearance in a swimsuit. She is silly and self-centred, another of those mysterious film heroines who only have children as friends and don’t seem to do anything other than be the heroine. Chitra is friends with Stalin’s sister. Jhansi is a pleasant and capable woman who has a good career and a loving family. Once Supreet and his rowdies start targeting people close to Stalin, personal strength goes out the window as all the ladies need him to set things to rights. 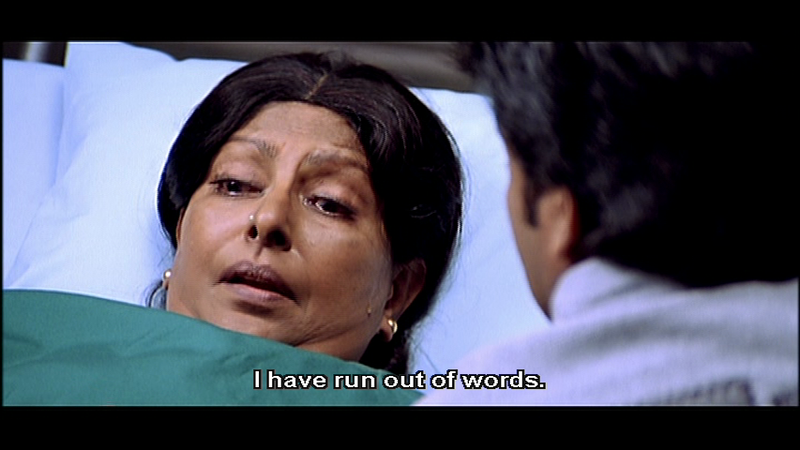 Sharada is great as the widowed mother who seems to have raised the kids alone. She is fiercely proud of Stalin and equally strong in her rejection of Jhansi who married an outsider. Some of her scenes are broad comedy, as she schemes with the dodgy priest (Brahmi) to marry Stalin off to a beautiful girl, any beautiful girl. I’d often wondered about the thinking behind ‘I Wanna Spiderman’ and it turns out a comedy uncle is to blame. 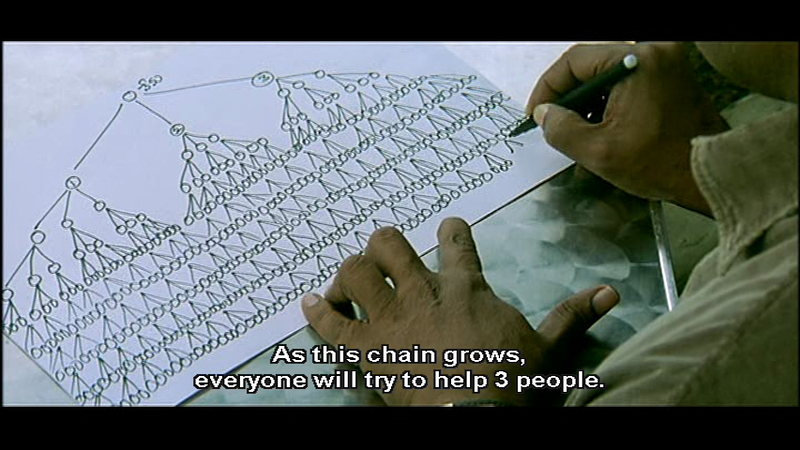 This is Brahmi’s fantasy which perhaps explains the costumes. Or not. 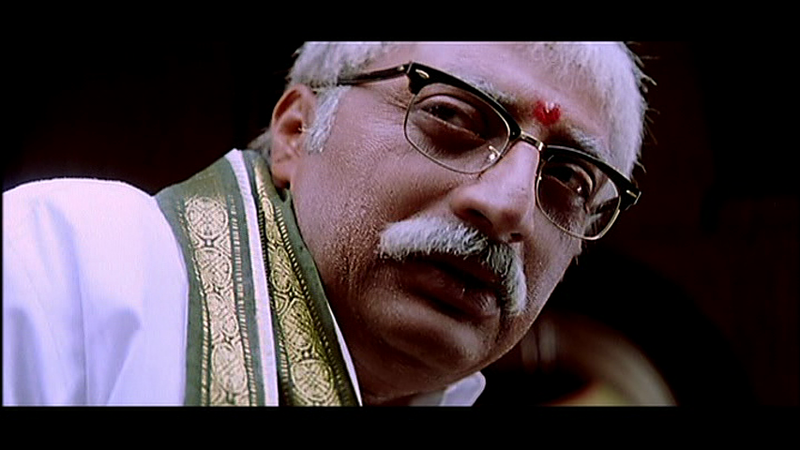 Prakash Raj is excellent as Muddu Krishnayya, a self-described Jekyll and Hyde. Even when Muddu Krishnayya starts to really lose his marbles he stays on task, although he does over-explain his plans which diminishes the likelihood of success. The support cast is familiar in faces and functions. Subbaraju makes a fleeting appearance as a creepy rapey guy, literally flying across screen following a heroic punch never to be seen again. Supreet does the villainous heavy lifting, earning an excellent comeuppance at Stalin’s hands. Mukesh Rishi and Brahmaji are Stalin’s Army comrades who come to help save the day when Stalin is under siege. Harsha Vardhan and Sunil are Stalin’s main comedy sidekicks. Everyone does their thing and does it pretty well. This is not exactly a family friendly film due to the violence, but it is not as empty as many mass films are since all the biffo and mayhem is for the good of Society. The story ends on a high note but getting there took some doing. It’s worth a watch for late career Chiru still in full possession of his famed charisma, and for the curiosity value of the loose remake. 3 stars! This entry was posted in Tollywood and tagged A.R. Murugadoss, Brahmi!, Chiranjeevi, Chiru, Harsha Vardhan, Khushboo, Prakash Raj, Sharada, Stalin, Subbaraju, Sunil, Supreet, Telugu, Tollywood, Trisha. Bookmark the permalink. Side note that has nothing to do with much of anything, but does the main character (or the film as a whole) ever comment on the, um, psychological baggage of rather large-scale sociopath-ness of his namesake? No Beth, not at all. Someone asked his mother why, since she objected to a Punjabi son in law, she had named her son after a foreigner. The explanation was just that they were staunch Communists. I’m sure there are figures in Indian history that inspire the same feelings as Hitler or Stalin do for me but it always seems most peculiar to hear those names bandied around. But you know, lots of filmi heroes are sociopaths – some just function better than others!